Eric studies how we intervene responsibly in ecosystem undergoing rapid change. His work is anchored in ecological restoration, but has expanded in recent years to include appropriate ways of intervening in hybrid and novel ecosystems (ecosystems without historical precedent in an era of rapid ecological, environmental and cultural change). 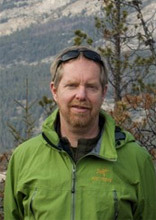 He has directed the interdisciplinary field-based Mountain Legacy Project, studying long-term landscape change in Canada’s mountains using repeat photography explore.mountainlegacy.ca. In addition to contributions to ES 200, he teaches courses on ecological restoration (341, 441, 482/582), a field course on Galiano Island, and contributes to a variety of ES courses. He is the author of articles and book, including Nature By Design (2003), Mapper of Mountains (2005; with Ian MacLaren and Gabrielle Zezulka-Mailloux), and co-editor of Novel Ecosystems (2013). From 2001 to 2003, Eric was chair of the Society for Ecological Restoration. He was Director of the School from 2002 to 2010. For more information, see Dr. Higgs' Expertise Database profile or Google Scholar. In this video, Dr. Eric Higgs discusses some of his hands-on fieldwork studying landscape change, the positive nature of ecological restoration, and the challenges facing restoration today.